Home » Posts » Dentistry » endodontics » Endodontics or extraction and implant for the pulpally involved tooth? Endodontics or extraction and implant for the pulpally involved tooth? There are a number of treatment options for the pulpally involved permanent tooth. 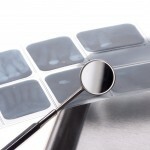 These will depend primarily on the prognosis of the individual tooth and patient’s preferences. These could include endodontic treatment or retreatment and/or apical surgery, or extraction with or without implant placement and restoration. The aim of this systematic review was to answer the following clinical question: Which is the best treatment option for a pulpally involved tooth? Searches were conducted in the Cochrane Library, Medline and Science Direct databases supplemented by hand searches of the journals; Clinical Oral Implants Research, International Endodontic Journal, International Journal of Oral and Maxillofacial Implants, Journal of Endodontics, Journal of Periodontology, Journal of Oral and Maxillofacial Surgery, and Oral Surgery Oral Medicine Oral Pathology Oral Radiology. Randomised clinical trials(RCTs) , prospective (PC) or retrospective cohort studies (RC) , and cross-sectional studies (CS) performed on humans with at least 1 year of follow-up and published within the last 10 years were considered. 45 studies ( 2 RCTs,22 PC, 17 RC, 2 CS and 2 cost effectiveness studies were included. Endodontic treatment success varied from 42.1%–86% after 2 to 10 years and from 84.1%–88.6% after 4 to 10 years for endodontic retreatment. Survival rate of dental implants varies from 91.8%–100% after 1 to 10 years. 1 study detected higher survival rates for implants. The endodontic treatment and the implant placement are both valid and complementary options for planning oral rehabilitation. Although a level B recommendation (SORT) can be stated, these results come from retrospective comparative studies because there is a lack of randomized clinical studies comparing both types of therapeutic options. Studies on dental implants are less demanding than those studies on endodontics because the majority of them only provide information on survival and not success rates. This review helpfully summarises the success rates of different treatment approaches for the pulpally involved tooth. However, there are no high-quality studies comparing the different treatment approaches so the results should be treated cautiously. The autos have used the SORT approach to assess study quality. While this is a relatively simple system that advocates the use of patient-orientated outcomes rather than disease orientated outcomes and simple to apply it is not widely used internationally. Given the nature of the included studies the use of the Newcastle-Ottawa scale to assess study quality would have been helpful. The development of a common core set of patient related outcomes for dental treatment interventions would be helpful for researches and reviewers in the future as well as common clinical outcomes as the lack of consistent reporting impacts on the benefits that can be gained from systematic reviews.